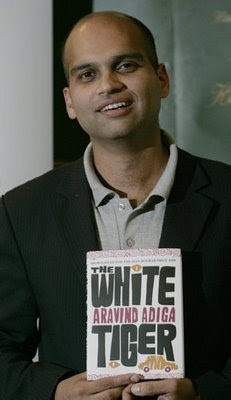 Aravind Adiga is tonight bagged the prestigious £50,000 Man Booker Prize for Fiction 2008 for his novel The White Tiger, published by Atlantic. Thirty year old Indian writer was awarded in prize ceremony held at Guildhall, London. Adiga becomes the fourth debut novelist, and the second Indian debut novelist, to win the award in the forty year history of the prize. The three other debut novelists to have won the prize are Keri Hulme for her novel The Bone People in 1985, DBC Pierre in 2003 for his novel Vernon God Little and Arundhati Roy in 1997 for The God of Small Things. Adiga, who was desirous to become novelist since his teenage was born in Madras is presently living in Mumbai. He is the fifth Indian fiction writer to won the award joining VS Naipaul, Salman Rushdie, Arundhati Roy and Kiran Desai who won the prize in 1971, 1981, 1997 and 2006 respectively.